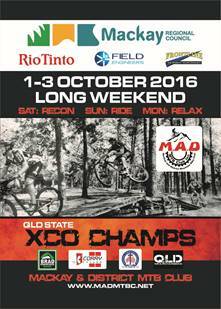 Travelling to Mackay for the QLD STATE XCO Champs and looking for Accommodation? Book with one of our event partners (Quest, Rowallan Park and now Paradise Lodge Motel) to receive a great discount. Paradise Lodge Motel is located in the heart of the Mackay CBD. There is plenty of large off street parking (suitable for trailers), lovely gardens, free BBQ for guest use and facilities to clean your bikes/vehicles. We are within walking distance to the Austral Hotel, Canelands Shopping Centre and many others including restaurants and cafes. All our rooms have free WIFI, TV, air-conditioning, bar fridge, tea/coffee making facilities, microwave, kettle and toaster. Room configurations: 1 x Queen bed or 1 x Queen & 1 x Single bed. To secure your discounted rate, when booking please advise them that you are a competitor in the QLD State XCO Champs. PreviousBonus MAD MTBC XCO State Champs Practice Race 10th September.